Fantasy football strength of schedule data is easy to find on the interwebs. A simple search yields tons of results, and this information is largely the same regardless of the source. But I have a secret to share with you. The information that you’ll find doesn’t actually tell you the strength of schedule for a player at a given position on a given team. What you’re actually getting with that data is past performances. Team X surrendered an average of 15.1 fantasy points per game to wide receivers last season. But here’s the problem: we aren’t playing in last season. We’re playing right now, which makes the data contained in most fantasy strength of schedule charts inherently flawed. So how do we fix this problem? It’s surprisingly simple. Instead of basing strength of schedule on last year’s information, we need to base it on the current defensive rosters. This will give you a more accurate picture of a player’s slate of matchups over the course of a season and is fluid enough to change not only on a weekly basis during the season, but also allows us to account for the fantasy impact of surprise game-time inactives. At Pro Football Focus, we not only have a wealth of data at our disposal, but we also have the advantage of our player grades. Over the offseason, I studied the relationship between player grades in different phases of the game and fantasy output by the four skill positions. As you could image, teams with players who grade out poorly against the run tend to give up more fantasy points to running backs. Likewise, defenses with low-grading cornerbacks in coverage give up more fantasy points to wide receivers, and so on. If you want to take a look at the fantasy strength of schedule charts for all four skill positions, we have them fully updated in the PFF Fantasy Playbook. But right now, let’s take a peek at the best and worst schedule for wide receivers this season. Before we do, just a quick word of caution. It’s easy to let strength of schedule become the be-all, end-all, but avoid that temptation. The reality is the difference between the best and worst schedules isn’t as drastic as you’d image. So use strength of schedule as one piece of information in your fantasy arsenal, but certainly not the whole thing. 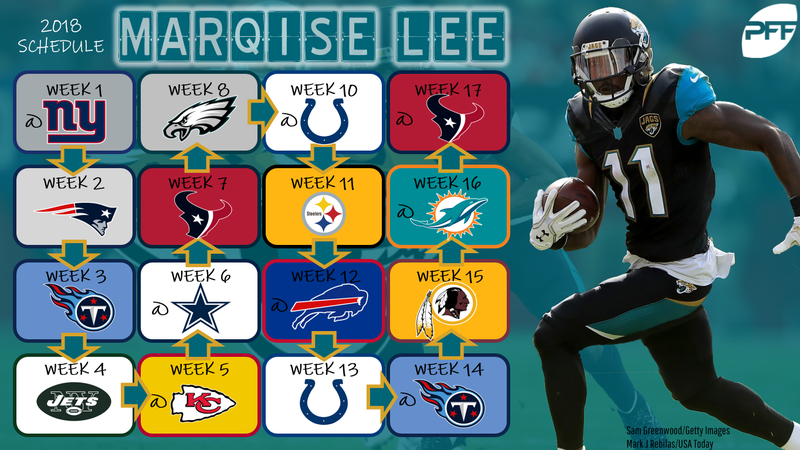 The Jaguars wide receiver group is a bit tough to decipher right now with Marqise Lee, Keelan Cole, Dede Westbrook, and Donte Moncrief all in the mix for playing time. However, the schedule would suggest that there’s upside from this group. Jacksonville gets plus matchups against the Giants and Jets early in the season and have the advantage of facing the Texans and Colts twice during the season. One of the advantages of playing in the AFC South is getting to play against AFC South secondaries. However, unlike the Jags, Houston actually has to face the Jacksonville secondary. Either way, the Houston receiver corps has a favorable outlook with Deshaun Watson back under center. DeAndre Hopkins and Will Fuller have an extremely favorable playoff schedule with the Colts and Jets in Weeks 14 and 15. Julian Edelman is suspended to start the season, which muddies the waters somewhat in New England. Chris Hogan is the favorite to lead this group in targets in September with Eric Decker as a dark-horse name to know. The Patriots face plus matchups against the AFC South and get a delicious schedule against their own divisional opponents, especially against the Jets who are the No. 1 matchup entering the season. Like the Jaguars, the wide receiver situation in Dallas is far from clear entering 2018. Allen Hurns has been widely considered the No. 1, but rookie Michael Gallup has flashed in the preseason. So this is a tricky group to draft from, but there’s certainly upside for the Cowboys with the Giants on the schedule twice this season. For most of the offseason, we simply assumed that Marvin Jones and Golden Tate were locked in as the top two receivers with Kenny Golladay as the No. 3. Well, that may be changing, as Golladay played ahead of Tate in 2-wide sets in the Lions’ second preseason game. Keep an eye on that situation, because Detroit has a plus schedule for receivers. Sure, they do have some tough divisional opponents in the Vikings and Bears. But the Lions also draw plus matchups down the stretch, especially in Week 15 versus Buffalo. 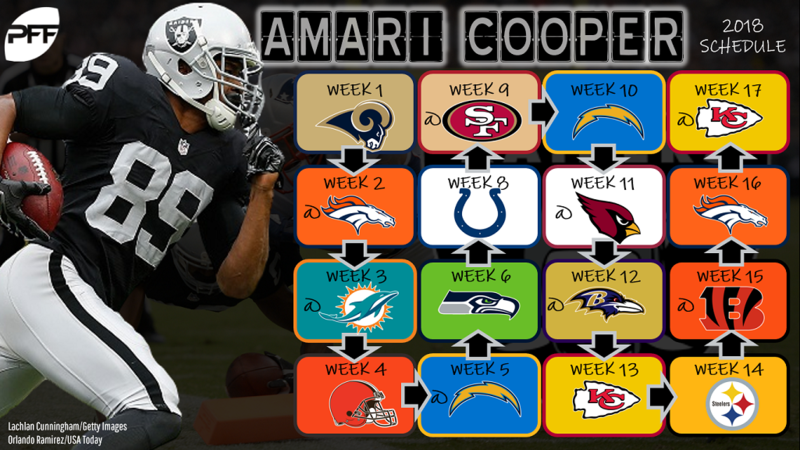 Amari Cooper has been touted in some fantasy circles as a post-hype sleeper, but his schedule isn’t going to do him any favors. The same thing can be said for Jordy Nelson. Facing the AFC West isn’t the recipe for success. To make matters worse, the Raiders also will square off against the AFC North with brutal matchups during the fantasy playoffs against the Bengals and Steelers. Cincinnati has an emerging stud corner in William Jackson. Get to know his name. Don’t worry about A.J. Green. He’s going to get his regardless. But the schedule could impact John Ross in his first season as a starter. The Bengals get a tough divisional schedule with two matchups against the Ravens and Steelers and also have to face the Chargers in the first week of the fantasy playoffs. Likewise, don’t worry about Antonio Brown. He’s the goat of this generation. But this could be a reason to avoid overvaluing JuJu Smith-Schuster and James Washington. Like the Bengals, the Steelers have tough divisional schedule and have to face tough coverage from the AFC West. The also get a rough stretch run with tough matchups against the Jags in Week 11 and Saints in Week 16. Patrick Mahomes has already showed that he can throw the ball a mile, which bodes well when you have a speedy receiver duo in Tyreek Hill and Sammy Watkins. However, the Chiefs get arguably the worst wide receiver schedule with matchups against the AFC West and AFC North. Of course, that means the Chargers twice, with those matchups coming in Weeks 1 and 15. The Chiefs also have to face the Rams this season.